If you put a powerful weapon in the wrong hands, it can have disatrous consequences. A hired assassin needs to kill more people. Violence. Santized swearing. One thing after another plotlines. Being insanely prolific. Not worrying about the details. Uncomplicatedly evil villains. 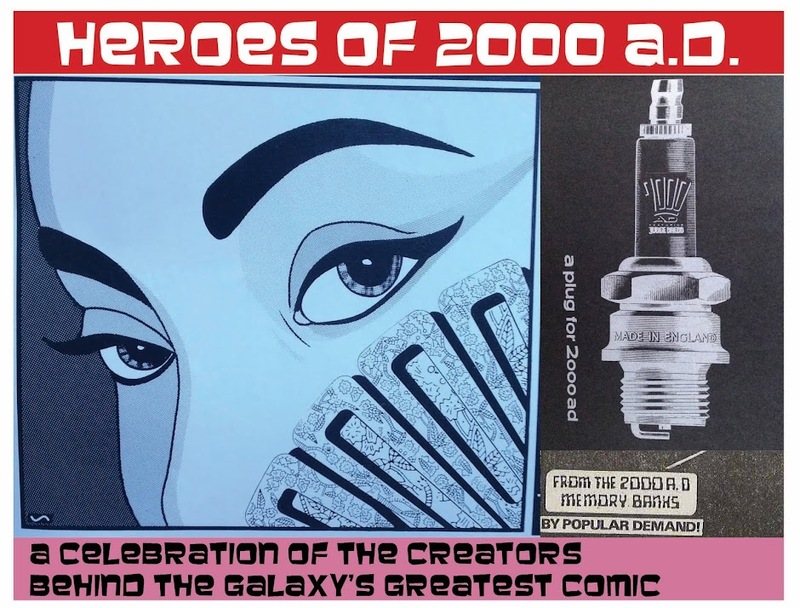 It’s sometimes said that American comics writers don’t get 2000AD*. This is, I assume, almost exclusively based on the unfortunate 2000AD career of Michael Fleisher – perhaps the comic’s least fondly-remembered creator droid. I might remind blog readers that the principle here is to celebrate the good stuff, but I can’t ignore the derision that tends to surround the poor man. His 1970s run on The Spectre is, I gather, what put his name on the map, and made him seem like a good fit for 2000AD come the late 1980s, when editorial needed some new but seasoned writers to fill some gaps. It’s a fun comic from an art and insane nastiness point of view. The actual scripting, on the other hand, is pretty much on the same level as his later 2000AD work. Which is to say, not very sophisticated but perfectly fine. And yes, I can see why a 2000AD editor might take a chance on him based on this work. In the end, it didn’t work out all that well, despite three attempts at getting new series on the go, and a regular supply of scripts that kept Fleisher’s name in the Prog almost continuously for two years. I don’t know if he was locking other creators / stories out, but he was certainly keeping the machine fed. And, if you didn’t read it too closely, the baseline of violence and gore was spot on for tone. Who knows – if he’d been given the chance maybe 10 years earlier, Fleisher might have had a friendlier reception. Basically what he was doing was writing violent boys’ action thrillers, designed to be read at such a pace that you don’t stop to worry about the plot, you just want to latch onto the characters and hope they’ll pull through the next cliffhanger. Not a million miles from, say Tom Tully or Gerry Finley-Day. Crazy one-liners - although it usually helps if they make sense, no? As a 12 year-old reader when Fleisher started, that style suited me pretty well. Certainly I was excited by Harlem Heroes for a good 8-10 episodes, before it all started to stop making any sense overall; likewise Junker part 1 was good solid entertainment with a gruff edge; I remember looking forward to part 2! How little I knew of what was to come... Rogue Trooper, the original version, might well have been a decent fit. But, I as shall go onto explain in excruciating detail, asking him to continue Friday’s story was on a hiding to nothing. Back to the beginning. Harlem Heroes had a cast of somewhat cookie-cutter characters – but they worked. Especially with the likes of Dillon and Walker to bring them to sneering, sniping life. And, episode by episode, plenty of the action sequences were intelligible and fun. Delivering death - it's what 2000AD readers demand! Hallucinatory headphones - one of the more fun/intersting ideas Fleisher deployed during his tenure. Sad to say, the overarching plot just made no sense whatsoever, from the raison d’etre of the team, to the motivation of the villains, and above all the absolutely bonkers ‘plan’ enacted by said villains. This particular problem would go on to form a pattern. Even in the two short Harlem Heroes spin-offs, featuring Silver and Slice, fun moment-to-moment action was undercut by somewhat absurd villain motivation. Fleisher’s other original series, Junker, had perhaps the other problem. The overall story, clichéd as it was, managed to be coherent. Episode by episode, however, it will forever remain notorious for having a scene wherein the hero sticks his arm out of a spaceship window to shoot at the ship behind him (while in space). Artist John Ridgway wisely re-imagined the scene. Hero Dennehy, and his animal-esque sidekick Razzo, were tolerably fun, if rather too close to Han Solo/Chewbacca, but the less said about femme fatal Veejay the better, I fear. High stakes mix with healthy sarcasm; nothing wrong here. Which leaves us with Rogue Trooper: the further adventures of Fr1day. Having lately re-read these strips,** I actually feel a little sorry for Fleisher. He was given something of an impossible job. On the one hand, the goal was surely to produce some gung-ho future war violence fests, featuring action, gore and one-liners aplenty. To a certain extent, Fleisher was good at this, and delivered. But on the other hand, he had to keep it in the same basic milieu as previous story The War Machine. That story was, in large part, a poetic meditation on the nature of war – in its tone, visuals, its narrative style and even its plot. Fleisher borrowed the narrative style (sort of), and attempted to borrow the tone, too – but that’s the hardest to pull off without having the other two things in tow. As far as I can tell***, Fleisher’s overall plan for Fr1day was to chuck him onto a planet that is in the aftermath of a devastating war. Pockets of rebels (for want of a better word) are still fighting, although they don’t necessarily know why or who. FrIday ends up battling with pretty much everyone at some point. But there are some proper baddies, too. even a children;s comic should come up with better swears! More inventive gruesomeness: death spheres! These are, I think, various subsidiaries of Clavel corp who are set on exploiting various natural resources on this dead planet, presumably to mine/produce stuff they can sell on other planets, and most especially taking delight in ravaging the fragile eco-system of Earth (or Nu-Earth, or wherever – it’s never entirely clear to me what planet Fr1day is on…). So the goodies end up being eco-warriors, lead by the appropriately-named Gaia. Key exposition finally revealed in like the penultimate epsiode. Maddening. If he’d actually explained this at any point, Fleisher might have got away with this set up. But he’s hampered by the first-person narration thing, left over from Gibbon’s ‘grown up’ version of Rigue Trooper. Part of the schtick of the story is that our man, Fr1day, generally has no clue what is going on around him – but that means we the reader are similarly lost. To an extent, this very fact is perhaps the part of Fleisher’s run that best captures the tone of Gibbons and Simpson’s work. War is not only hell, it’s also hella confusing. But what it meant was that all we ever saw was Fr1day tumbling from one random violent encounter to the next, never really clear on how or why he knew who to trust, except for that one lady he has a massive crush on. But, you know, from time to time there’s classic 2000AD silliness in seeing big men with big guns kill each other while making snide remarks, and context doesn’t always matter. The ingredients are all there: bizarre villain, high-tech hero, blazzing gun action. But that dialogue! I don't even know if that counts as a put-down. Don't even ask what his deal is. years later, the Harlem Heroes were tarted up both through dialogue playfulness and an artistic clash of old-school Kevin Hopgood pencils beneath hyper-stylized painting from Siku. -and I'll be honest, I had a lot more fun re-reading this series of HH than I did the first one. It was, I think enough to make for sufficient entertainment week on week, if an utterly unmemorable whole. Paul B. Rainey's excellent ProgSlogBlog is still available to read. Here's his page on Harlem Heroes. 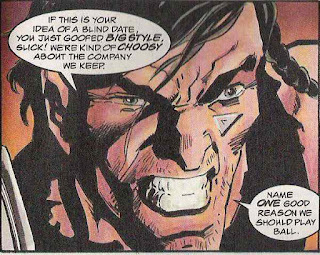 The Tea Room of Despair's blog has a lovely general 2000AD life-story piece that namechecks Fleisher's role in farily typical fashion. Plus, there’s a smattering of post-Gibbons/Simpson stories in the back of the book, which is a bit like watching a time-lapse film of a slice of bread decomposing, qualitatively. Rogue Trooper: The Saharan Ice-Belt War + Apocalypse Dreadnought were fun the first time around, with me age 12/13. They haven’t entirely held up. One more hit of goofy dialogue for your thrill-receptors. *Clearly untrue, bearing in mind that no less a 2000AD hero than John Wagner is in debt to the good ol’ US of A for a fair part of his formative years. **Which are, I fear, not fit for reprinting even as a Megazine floppy. ***I even bought the Rogue Trooper Annual on ebay, which bridges ‘The War Machine’ and ‘Golden Fox Rebellion’, hoping it would clear things up. Not so much! I lettered some of that stuff. Looks not too bad, even after all this time. He was working for 2000AD after I'd ceased reading it regularly, but it was certainly a surprise when I picked up a prog and encountered the 'Spectre' writer.